It’s time to enter the dark side of Borgova and the forbidden wilderness, but beware: you are not the only one behind a mask. Discover four new areas and the secrets they hide: the Sanctuary, the Island of Bones, the Inkheart Mines and the Crystal Bastion. 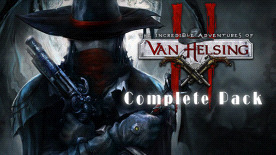 The Incredible Adventures of Van Helsing II Soundtrack Created by Gergely Buttinger. Unlocks the Pigasus: you can summon a new creature by spending Essence and you can purchase powerful items in your Lair from the Pigasus.